Chandra Babu Is The Future PM Says Deve Gowda | Deve Gowda News Chandra Babu Is The Future PM Says Deve Gowda: Deve Gowda left Chandra Babu in heaps of praises calling him the next Prime Minister of the country. 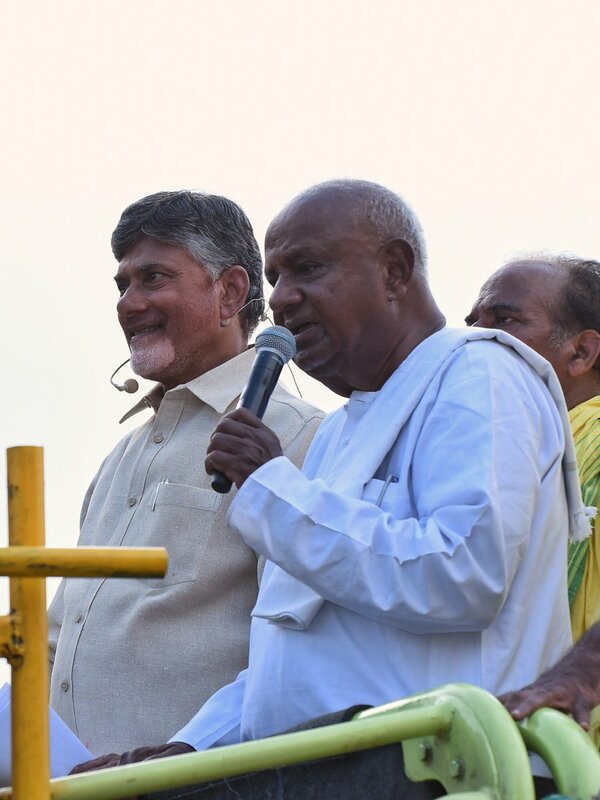 Chandra Babu Is The Future PM Says Deve Gowda:- Senior politician and ex-Prime Minister HD Deve Gowda share a close bond with AP Chief Minister Chandra Babu Naidu. He extended his support for TDP in the state and campaigned in the state yesterday ahead of the polls. Chandra Babu Naidu and Deve Gowda participated in a massive political campaign meet in Tiruvuru town, Krishna district last evening. Deve Gowda left Chandra Babu in heaps of praises calling him the next Prime Minister of the country. "Chandra Babu is capable of uniting all the regional parties which will have a crucial role post polls in the country. No national party will get a complete majority and the regional parties will have a crucial assignment. Chandra Babu shares a good relation with all the regional parties and he can unite them. KCR's Federal Front will be a huge flop as he cannot go ahead with the support of regional parties. Narendra Modi is staging attacks on his rivals through CBI raids" said Deve Gowda. Earlier before this, Chandra Babu welcomed Deve Gowda in his Undavalli residence. The duo traveled in a private helicopter to participate in the election meetings.